A very close friend of ours, Sammy, has recently been diagnosed with Breast Cancer at the age of 27. Sammy Brandon is an outgoing and important member of the Providence team and whilst she is putting cancer back in its place, her colleagues have decided to host a fundraising static bike ride, to put cancer back on it’s bike! 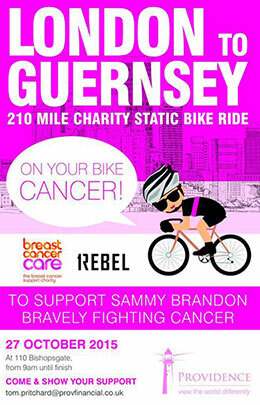 In support of her courage and tenacity, the team are putting on pink shorts and cycling for the day. They will be cycling the distance from their London Business Development hub to their HQ in Guernsey in the Channel Islands (approximately 210 miles) today, on two static spinning bikes donated by 1Rebel. You can show your support by visiting 110 Bishopsgate as the team will not quit until they have completed the 210 miles! To help raise money for breast cancer care, a cycling relay is being held by Providence Financial where Sammy’s colleagues are cycling 210 miles over the day. You can help Sammy back to work by visiting the justgiving donation page. It’s very important you regularly check your breasts for abnormalities or changes in appearance. If you are not sure how to check yourself, here’s Five Steps of a Breast Self-Exam that you can perform at home, to make sure everything is normal. Unfortunately, as a result of breast cancer, some women have to have their breasts removed (known as a mastectomy) to save their life. As a result, cosmetic surgery can help these women to regain their confidence. To discuss our cosmetic surgery options please contact us. All of our treatment consultations are free.